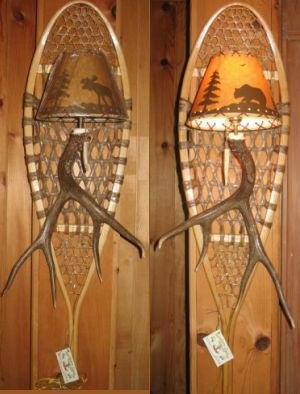 This single Snowshoe Sconce with a large beautiful whitetail shed antler measures 42 inches x 12 inches. An antler tip pull chain adds to the rustic look. Available in right or left mounted. Shade is not included. Each antler sconce creation is unique. This Snowshoe Sconce makes a striking accent piece for cabin, lodge, or rustic decor. This unique antler piece brings nature to your cabin, lodge or rustic decor in a beautiful rustic way.